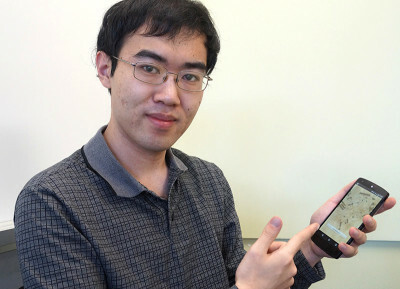 Kunli Zhan, demonstrating his Marauder Sheridan app, available for Android devices. Photo by Vinaya Gopaal for Sheridan Curiosities. It is the year 2015. Do you know where your friends are? With Kunli Zhan’s new Marauder Sheridan mobile app, you will. Once users log in to the program, they are plotted on a map of Trafalgar Campus. Students will then be able to see where they are on campus, and where to find others who are currently using the app. The software determines the locations of its users by using Wi-Fi or cell signals that are nearby. The locations of users logged in to the app are updated every few seconds, as long as the app is in use on the user’s mobile device. 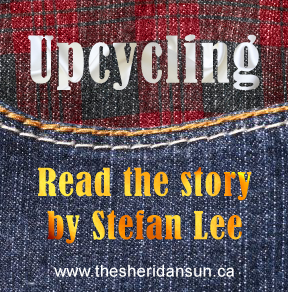 “I created the first prototype of the map in March 2014,” said Zhan, a fourth-year Sheridan Animation student. “I’ve been making interactive applications and animation with Flash for many years, but in 2014, I began looking into using Flash to publish for mobile devices. The newer versions of the Adobe Creative Suite came with the ability to publish Flash for Android and iOS, and this prompted me to create something unique,” Zhan said. One idea that came to mind while developing the software was to use the geo-location capabilities of a mobile device to some effect, such as making a map. “Thinking along those lines got me to consider the Marauder’s Map,” Zhan said. Zhan is a fan of the Harry Potter series, and got the idea for the app from the Marauder’s Map document that displays the layout of Hogwarts School of Wizardry. Initially, the app’s accuracy only allowed users to see which wing of the school another user is in. The app now has the capability to more precisely pinpoint locations in several wings on campus. Alison Chan, another Sheridan Animation student who has been using the app since it was in its testing phase, said she would use the software rather than call friends, provided they have it. Marauder Sheridan is currently only available for Android devices and its functionality at Davis and HMC is still being explored. Added by markelgie on March 10, 2015.